The Silentaire Val-Air 100-50 AL Ultra-Quiet Air Compressor provides automation power and portability with a safety valve. This heavy-duty ½ horsepower pump has a tank, pressure regulator and built-in moisture trap. It also has line pressure and tank pressure gauges, and the carrying handle with unit wheels makes it easy to transport. The Silentaire Val-Air 100-50 AL interior is coated with a rust-proof seal, and it has an in-line oil mist removal filter that preserves the tank as it maintains optimal performance. 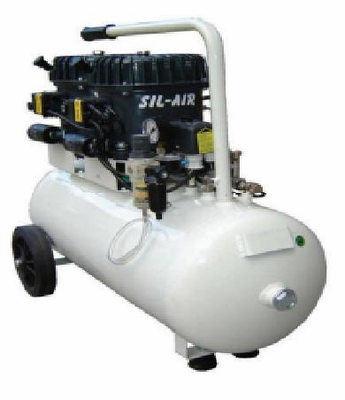 This top-of-the line travel compressor could fit in the corner of a garage or in the back of a truck. It weighs 166 pounds and has a 13-gallon tank capacity. Oversized shipping: $166.50.